Samsung Galaxy series is the biggest successor of Samsung Mobile makers because it has boost the economy of company which provides the enhancement in further development of Samsung Galaxy Smartphones. 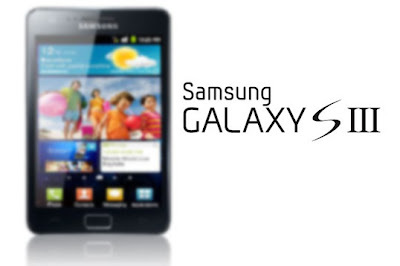 After the successful launched of Samsung Galaxy S I and Samsung Galaxy S II Smartphones now company is focusing to build its third coming Galaxy S smartphone series called Samsung Galaxy S III with fully loaded advanced features and the integration of latest Android Operating System. According to the rumors, Samsung has started the development of Samsung Galaxy S 3 Smartphone and it will soon going to launch in Q3 of 2012. 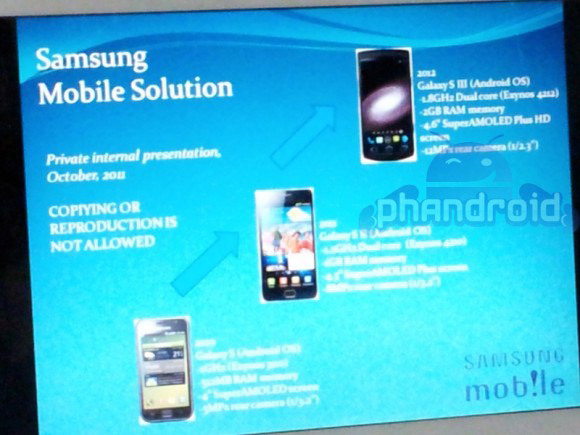 The Samsung Galaxy S III specifications and details has been revealed on internet, if we believe the following picture taken from Samsung Mobile. 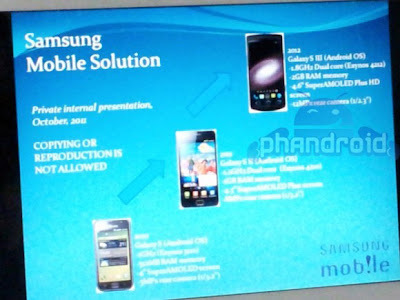 The image in question not only tells us when, but what we can expect from the yet to be announced Samsung Galaxy S III Smartphone, in a slide detailing the progression of the Galaxy S family. According to the above image the Samsung Galaxy S III Specifications will be based on Exynos 4212 1.8 GHz dual core processor with 2GBs of RAM with 4.6 inch Super AMOLED HD display that will provide HD resolution without the PenTile technology found in the current Samsung screens and to finish the list off, the upcoming S will supposedly have a whopping 12MP camera and a large Super AMOLED Plus HD display with a resolution of 1280x720. The Samsung Galaxy S 3 Smartphone will also have the fully loaded features like LTE and NFC support (which will tie in nicely with Google Wallet) as well as a flat display and Galaxy S III will also apparently include the four typical Android buttons, despite a 99% certainty that it will be running the latest Ice Cream Sandwich build of Google's mobile OS. The price of the Samsung Galaxy S III Smartphone is yet to be announced by the Samsung Mobile and It will be available in Q3, 2012 (not confirmed yet).